Just because your food is frozen, doesn’t mean it’s safe. 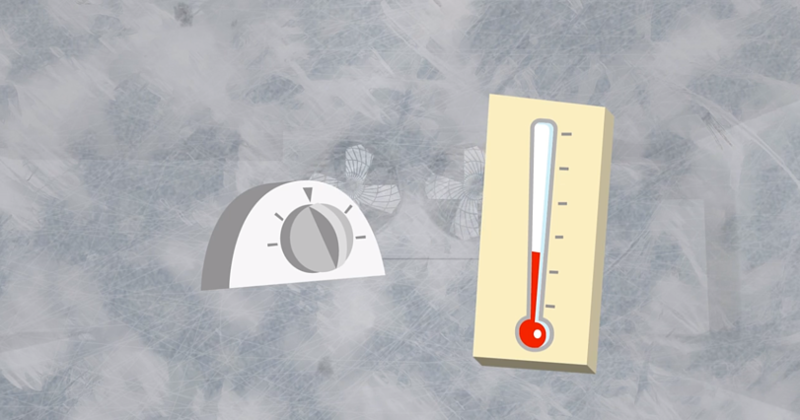 For proper food storage, the ideal temperature for commercial freezers is at or below 0 degrees Fahrenheit. This keeps food completely safe for consumption by preventing bacteria from growing at the frigid temperature. What about temperature fluctuations? In a commercial kitchen, warm air and frequent openings of the freezer door will cause the unit’s temperature to go up and down. That can cause an inaccurate temperature reading if there is a prolonged exposure to outside air, not to mention a buildup of frost. Food quality will diminish over time, even at ideal freezing temperatures due to freezer burn. Flavor, aroma, color, and tenderness are all negatively impacted by exposure to air over time, so it’s important to know how long you should keep food frozen and package it properly. The FDA recommends freezing the following foods for a specific period of time. See the full chart here. When food is frozen properly, it ensures that your foodservice operation is cooking and serving safe, high-quality food to your guests. Not only does that reduce food waste, but combined with energy-efficient refrigeration systems, the cost savings are even greater. The RDT Eco-Smart is an electronically operated evaporator controller designed to save energy in walk-in freezers. When connected to the internet, operators can view temperature logs from their phone, tablet, or computer. Don’t wake up in a cold sweat in the middle of the night worried about your walk-in. Monitor the freezer temperatures right in bed. And when the Eco-Smart is alerted to something wrong with your freezer, you will be too. See how reduced food spoilage and temperature monitoring are just a few of the benefits a foodservice operator will experience with the Eco-Smart.